Yankee Candle Lemon Lavender Reeds is rated 4.8 out of 5 by 12. 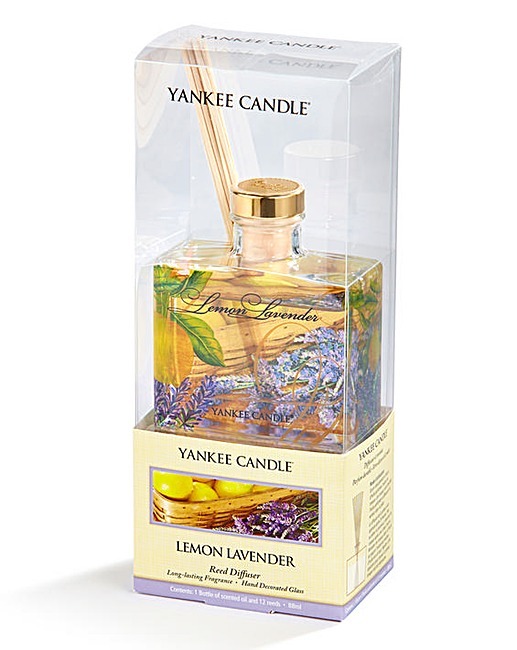 Yankee Candle Lemon Lavender Signature Reeds. Clean and inviting... a powdery fresh blend of tangy lemon citrus and sweet lavender flowers. Up to 8 weeks consistent fragrance. Rated 5 out of 5 by Jezebel51 from Gorgeous smell! These were out of stock when I first ordered them, but were well worth waiting for. Lemon Lavender is my favourite Yankee fragrance and they smell absolutely gorgeous. Rated 4 out of 5 by Jane from Attractive presentation, I have used it for three weeks and the scent is fresh,understated, and charming. Rated 4 out of 5 by Jude from Nice container Has a lovely aroma but could be a little more 'lemony' but very nice in my living room. Rated 5 out of 5 by Looby loo from Fabulous Great smell. I love anything Yankee candle. These reed diffusers smell amazing. Rated 5 out of 5 by Mandy from yankee candle diffuser Bought item as gift but it all came in perfect condition. Rated 5 out of 5 by pumpkin from Love this fragrance I was given one of these as a present last year, and not able to buy a refill, I looked around and this was by far the cheapest I found. It was delivered within days of order, so well packed, that apart from a large, heavy object falling directly on top of it, there was no chance of it getting damaged in transit.